Note: The WinkBed is a very tall 16" mattress sold exclusively online. It has a unique double layer of pocketed coils topped by gel foam under a heavily quilted pillow-top-like cover. Is the WinkBed right for you? Read our take on this luxury-style mattress. If you’d prefer to watch rather than read, check out our full WinkBed mattress video review above. GoodBed's Take – Who is the Best Match for a WinkBed Mattress? The WinkBed is made of foam and pocketed coils, but differs from the competition in that there are two layers of pocketed coils in this bed, the 8" base support layer, and a layer of 2.5" "microcoils" higher up, under two layers of foam and a deep pillowtop. That gives the mattress, in our opinion, an interesting feel that reminded us a lot of early pillowtop mattresses--very soft on the surface, yet quite firm right underneath. In our testing, strengths of the WinkBed include edge support, which was exceptional, and temperature. The WinkBed mattress has a number of cooling features, and as a mattress that's mainly composed of steel coils, it has good airflow by default. If sleeping hot is an issue for you, the WinkBed is worth consideration. In terms of back support, we felt the WinkBed would suit back sleepers very well. With the soft top combined with the firmer coils below, we thought it had a great feel for someone that primarily sleeps on their back. The mattress also performed well in our evaluation for side and stomach sleepers who like the pillowtop feel with firm support below. Among our concerns: As with many mattresses that includes coils (and the WinkBed includes two layers of them), motion isolation can be a concern because the springs create bounce. If you (or your partner) are easily disturbed by a partner's movements, or other disturbances (kids or pets), then the WinkBed may not be the best choice. Price-wise, the WinkBed is more costly than some competing online-only mattresses, but it's also a lot taller, and we do think it compares very well to the type of luxury coil beds you'll find in department stores. You can place the WinkBed mattress atop the support of your choice, including a separately purchased box support, a bed frame, platform bed, or adjustable bed frame. WindBed sells its own bed frames, but they are not required purchases. Free shipping is included, though in-home setup costs extra. Overall, the WinkBed mattress performed very well in our testing and evaluations. We judged construction to be of excellent quality. The WinkBed is a tall mattress. The company says it is 14.5" to 15" tall, while we measured it at more like 16." The top two layers are soft foam, under a heavy cushioned and tufted cover. Altogether, the top layers of the bed reminded us of when pillow top mattresses first became popular. Those top foam layers are gel-infused, intended to help channel heat from the body. Under the soft top layers is a 2.5" layer of pocketed steel coils, or microcoils. This coil layer is also fairly soft -- not nearly as firm as the lower support layer of coils further below. In between the two coil layers is a small layer of what the company calls lumbar foam. At the base is another 2" of standard polyurethane as a base for the coil unit. The layers of the WinkBed are wrapped in a sturdy feeling cover, with contrast fabric around the top two foam layers, and cording trim. The is quilted, and has quite a lot of loft to it. We found the WinkBed to be interesting in terms of softness. While the top is very soft and fluffy, the firmer support layers below are firm. So overall, we'd call the luxury firm version of the WinkBed a "medium" on our scale, balancing out the softer top and firmer bottom. This refers to how deeply you sink into the mattress or feel cradled or hugged, versus a feeling of floating on top of the bed. Again, the WinkBed felt very interesting to us; while the top certainly feels soft, the firmer coils below prevent as much sinking in as you would expect. Overall, we again felt that the WinkBed (luxury firm version) was right around a medium on our scale. The WinkBed does not include any memory foam, so there is none of that slow memory foam feel at all. The mattress springs right back after being compressed. Responsiveness also translates into bounce, and with most innerspring mattresses, you'll get a good bit of it. The WinkBed has two layers of pocketed coils, so it will certainly have some bounce. In our evaluations, the WinkBed mattress performed very well for our tester, particularly in the back sleeping position. But we also found it to be supportive and side and stomach sleeping positions, and felt that it would suit a wide range of individuals. 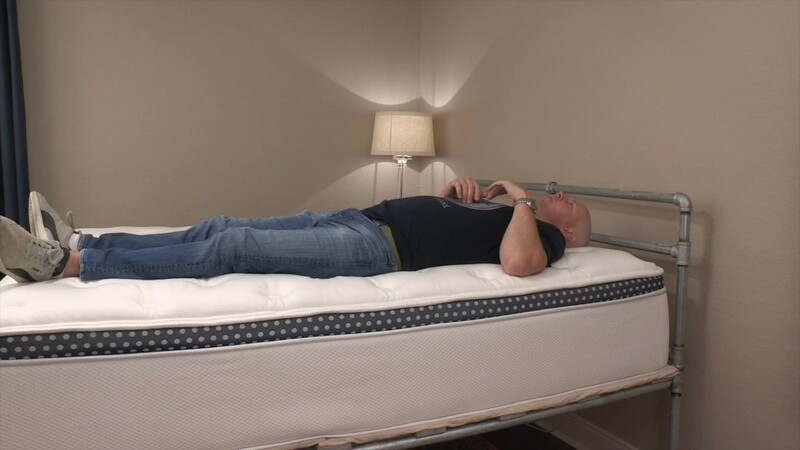 Our tester really enjoyed the WinkBed in this position; the combination of the soft top foam and the firmer coils beneath felt extremely supportive; we thought this mattress had a great feel for those that sleep primarily on their backs. Our tester experienced excellent spinal alignment and felt that most others would have a similar good experience. In our evaluation, side sleepers would also be well supported by the WinkBed. Our 200 lb. tester’s hips and shoulders sank into the bed just enough to create a neutral spinal position (he wished his shoulders could sink just a bit more, but it wasn't problematic). We also felt, again, that most people, even those heavier than our tester, would be well supported. We also felt that stomach sleepers would enjoy this mattress. For stomach sleeping, a firmer mattress is generally needed to support the hips from sinking too far and creating arching in the back. The WinkBed, for our tester, had plenty of support, but still felt soft and cushioned thanks to the soft foam on top. We think this mattress would feel especially nice for stomach sleepers that prefer that softness up top. Overall, we found the pressure relief offered by the WinkBed mattress to be excellent. The two top foam layers, plus the softer microcoils below made for very good pressure relief for our 200-lb. tester. And we felt that both lighter as well as heavier individuals would also do well in terms of pressure relief. For those with acute/chronic pressure relief needs, a memory foam or latex bed might be better overall, but for most others, we thought the WinkBed would be a good choice. If you are easily disturbed by a partner's movements in bed, or perhaps you and your partner go to bed and get up at different times, then motion isolation may be a priority for you. Innerspring mattresses in general are not the best choice, and the WinkBed has two layers of springs. The springs are pocketed in the WinkBed, so the movement of each spring is somewhat isolated. So while a pocketed coil bed like the WinkBed will be a better choice than a traditional innerspring mattress, a foam bed will likely better suit your needs if motion isolation is a priority. For most people, we do not think the WinkBed mattress will feel hot. The top layers of foam are infused with gel, a known conductor of heat. Spring and coil mattresses in general will naturally provide greater air flow than foam, and the WinkBed has two layers of steel coils, allowing for lots of air flow. Lastly, despite the fluffy top, this is not a deeply cushioned mattress, so most of your body is exposed to the air. If overheating in bed is an issue for you, we think the WinkBed would be a very good choice. Edge support is important if you like to sit on the side of the bed, or if you tend to sleep along the edge. We found the WinkBed mattress to be excellent in this respect. Our tester felt exceptionally stable both sitting on the edge of the WinkBed and laying right on the edge. He didn't feel like he was rolling off at all. If your pets or kids tend to push you towards the side of the bed, we think the WinkBed mattress is worth consideration. If you tend to move and change positions a lot over the course of a night, ease of repositioning will be a priority for you. The WinkBed mattress, despite its quilted and cushioning top, really shines in this area. Our tester had no trouble at all moving around or rolling into another position. 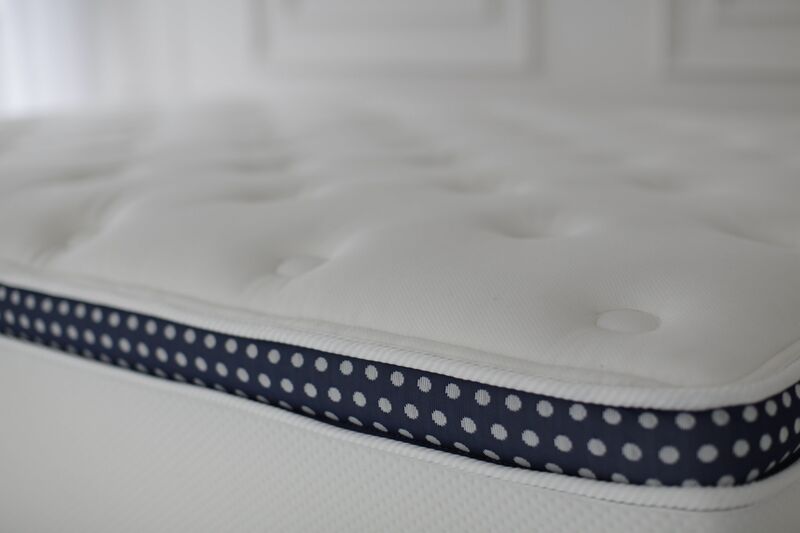 The WinkBed makes no claims to be a natural mattress, but the foams utilized are certified to the CertiPUR-US standard, which verifies that a material has low VOC off-gassing as well as a lack of chemicals and other substances regulated by the CPSC. And steel coils are not known for issues with off-gassing at all. 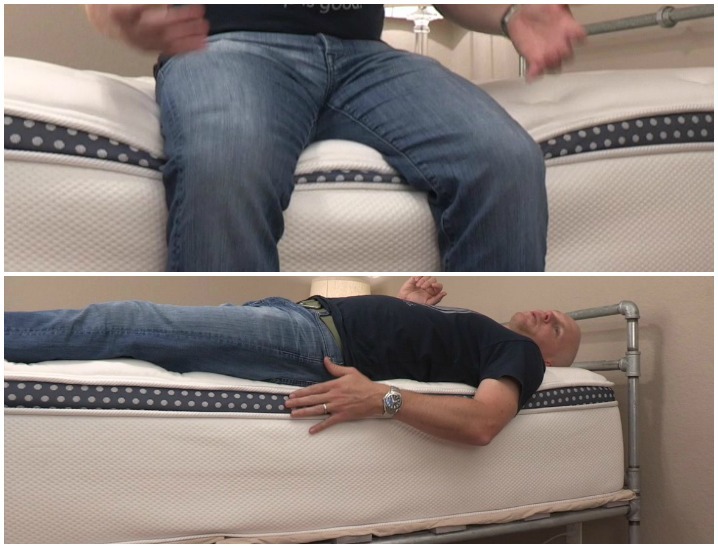 While we did not test the WinkBed mattress on an adjustable base, but the company does say on its website that the bed can be used with an adjustable base. The WinkBed is a very tall mattress (we measured it at 16"), where most sold-online mattress are typically 10" or 11". It has a luxury look; to us, it feels sturdy and well made. Our tester commented that it feels "majestic." Two layers of gel foam and a layer of microcoils form the bed's comfort layers, with a taller layer of support coils. That's an unusual configuration you don't see very often, either online or in stores. When it comes to estimating the comfort lifespan of a mattress, we can use foam density as our best, albeit imperfect, predictor of how long a foam will retain its shape and resiliency. In the case of the WinkBed Mattress density of all of the foams is 1.5 lbs. That is definitely on the low side of what we see in competing mattresses. With low-density foam, we wonder about body impressions. However, the microcoils are there for support underneath that top two inches of foam. Steel coils have long been used in mattresses and have a very good reputation for longevity and durability. We thought that the WinkBed compares well to similar mattresses you would see in a department store or high-end bedding store. When compared to other online-only beds, it does cost more than much of the competition, but it's also a very tall, luxury-look mattress. We feel the WinkBed is a good value compared to what you would find in stores, especially. WinkdBeds includes free delivery, which is not particularly unusual among its competitors. Delivery is by common carrier like FedEx, who will deliver the box to your door. WinkBeds does offer an optional white-glove service; for $99, movers will bring the mattress into your home, set it up in the room of your choosing and dispose of the packaging. For another $60, they will remove your old bedding. WinkBeds offers buyers a 120-day trial period, and requires buyers to give the mattress at least 30 days before initiating a return. Should you wish to exchange your bed for a different softness level, there's a $49 fee. See: WinkBeds returns policy. One of the biggest, if not THE biggest complaints about any mattress from consumers regards body impressions — the inability of a mattress to spring back, eventually creating a low spot/sinkhole in the mattress. 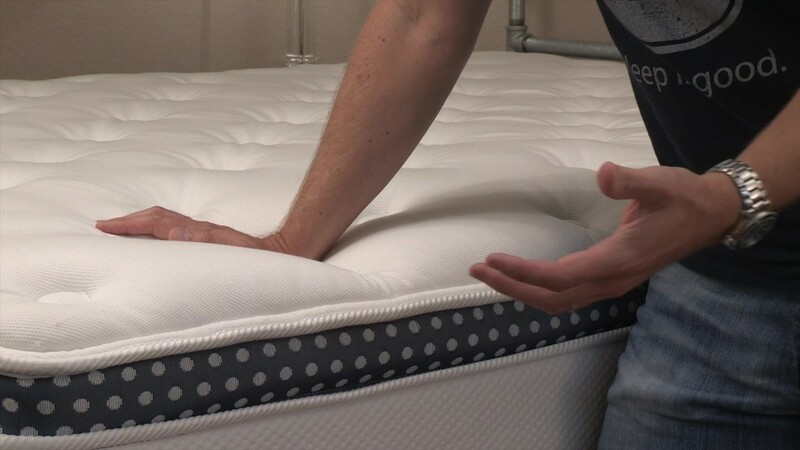 As such, mattress warranties all contain a term defining how big a sag or ‘body impression’ (measured when no one is on the mattress) is considered a defect, and thus covered under the warranty. The industry standard for hybrid and innerspring mattresses is 1.5". WinkBeds has chosen to cover indentations that meet or exceed 1.5”--right about average. Practically speaking, that means any softening or sagging would need to be at least that deep before the warranty would offer you protection. Summary: Is the WinkBed Mattress Right for You? The WinkBed is a traditional-feeling mattress made with two layers of pocketed coils plus gel foam. Here’s who we think the mattress is best for, based on our evaluation. Is the WinkBed right for you? Take our Mattress Match Quiz to find mattresses that fit your needs, based on your preferences and price range. Looking for more on the WinkBed mattress? Visit WinkBeds.com. 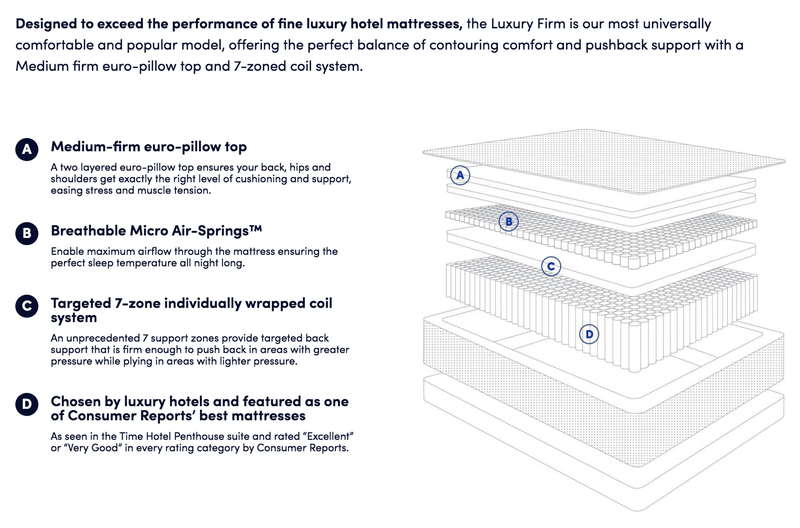 What goes into an ultra-luxury mattress?